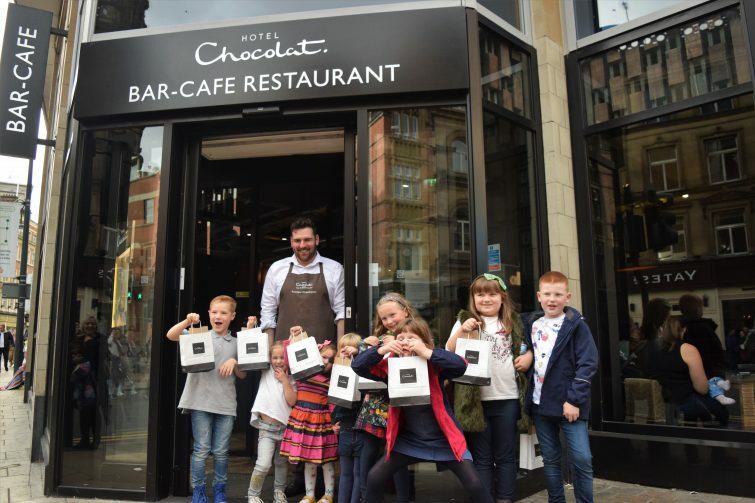 In the interests of full disclosure I’m going to start this post by telling you that my little sister has worked for Hotel Chocolat for a long time now and as such we are big fans of the luxury chocolate brand. 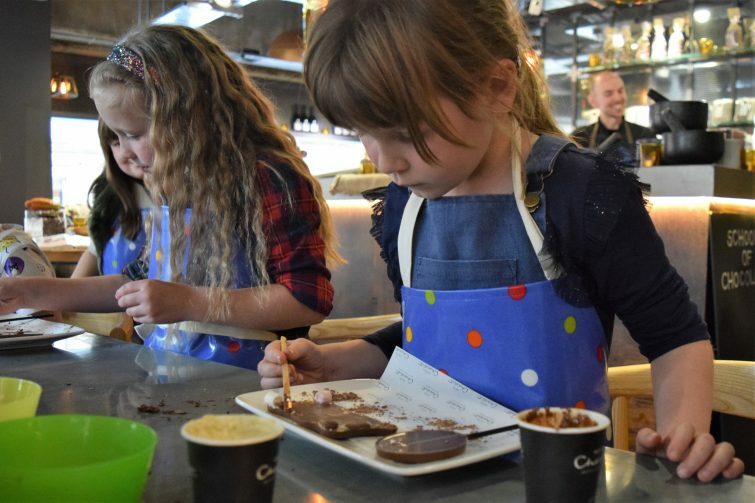 When she asked the kids if they’d like to review the new Children’s Chocolate Workshops for her there was only ever going to be one answer! 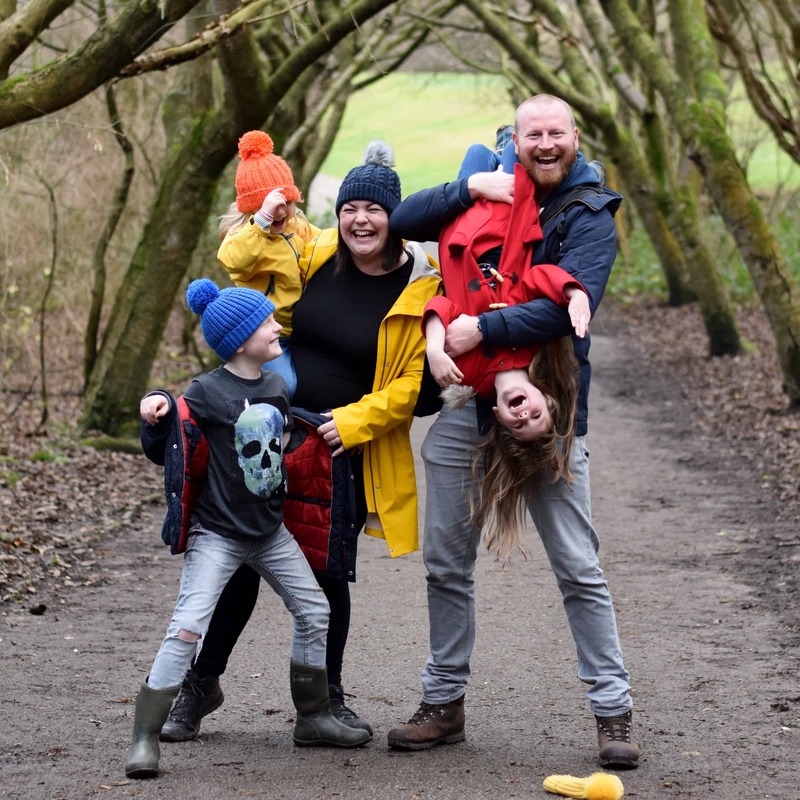 We set about inviting friends to come with us – we decided that 8 was a nice number as it meant that Ben, Chloe and Amy could invite a friend each as well as taking along Team Butler (who already feature fairly regularly on this site and in our vlogs). 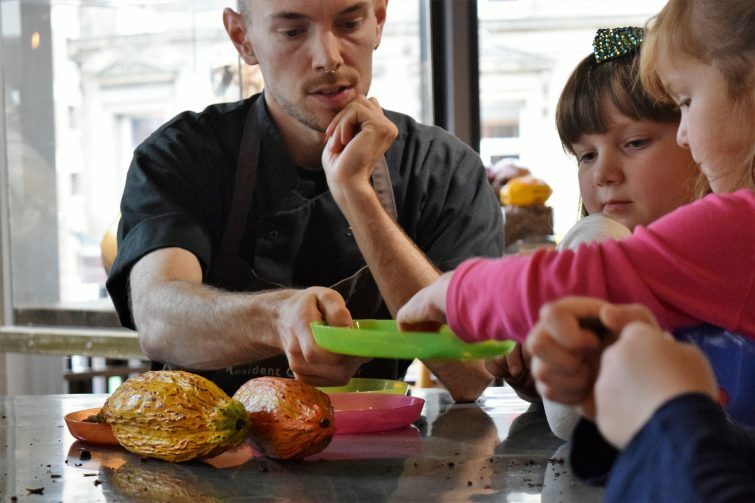 You can book the Children’s Chocolate Workshop for up to 19 guests but as we had to transport our guests to Leeds, 8 was plenty! When we arrived for our 2pm booking we were greeted by Sam, the store manager and Dan, an in-house chocolatier who took us upstairs into “School of Chocolate Lab”, which was reserved for us, and immediately set about making everyone feel welcome before asking everyone to wash their hands in preparation for the afternoon’s activities. 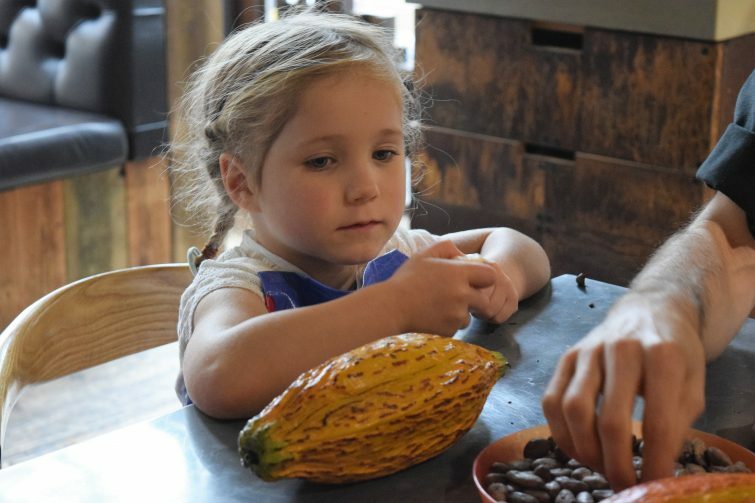 We started our Workshop with a lesson about where chocolate actually comes from – Dan showed us what cocoa pods and cocoa beans look like, encouraging us to smell and taste them as well as giving everyone the chance to hold some cocoa butter (which Ben thoroughly enjoyed warming in his hands and spreading everywhere!) 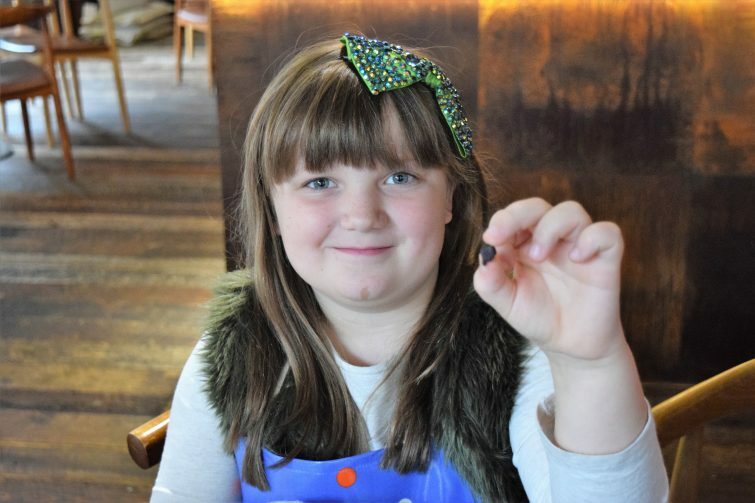 We were all impressed by how much the children already knew, especially Finley who had done a chocolate tasting experience at a food festival in the summer! 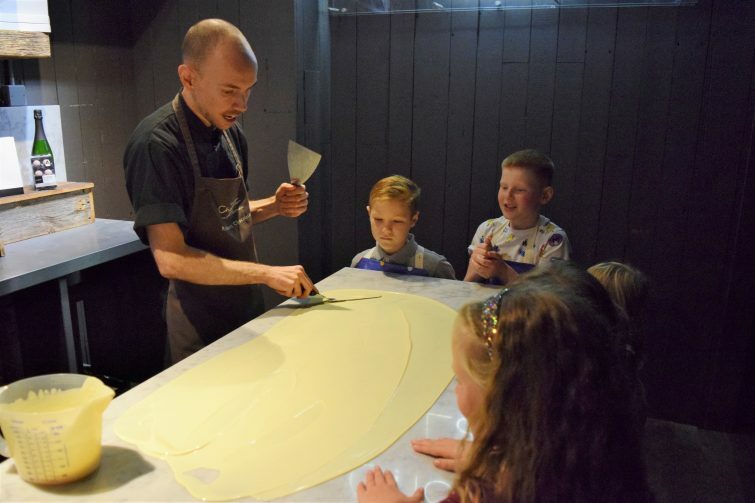 After our discussion about the ingredients it was time to have a little taste of a range of white, milk and dark chocolates to see what differences we could taste and if there were any extra ingredients giving new flavours to the chocolate. 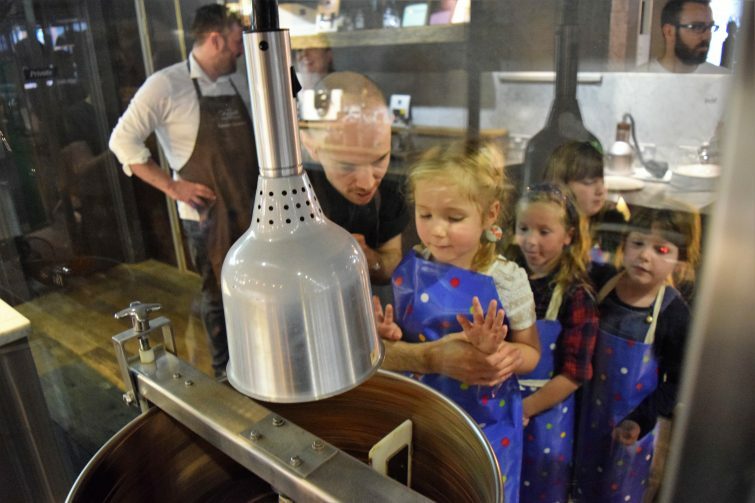 For the next part of our Workshop we trouped downstairs to see how chocolate is actually made. 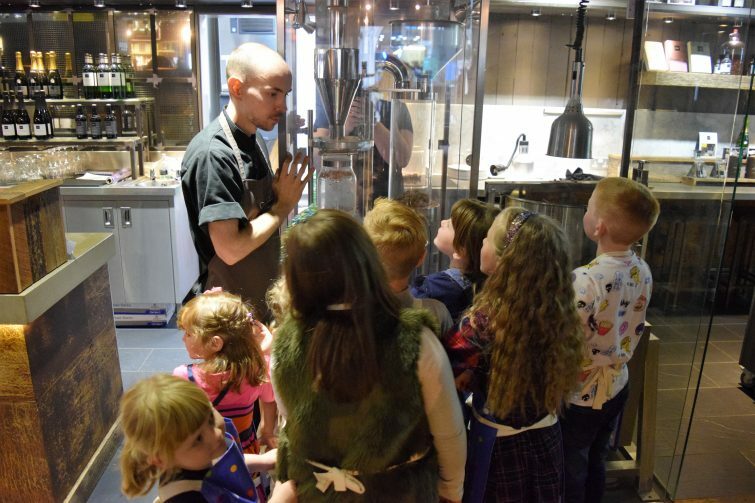 The cocoa bean roaster and conch machine is on display for all to see in the cafe so you can pop and have a nose next time you visit. 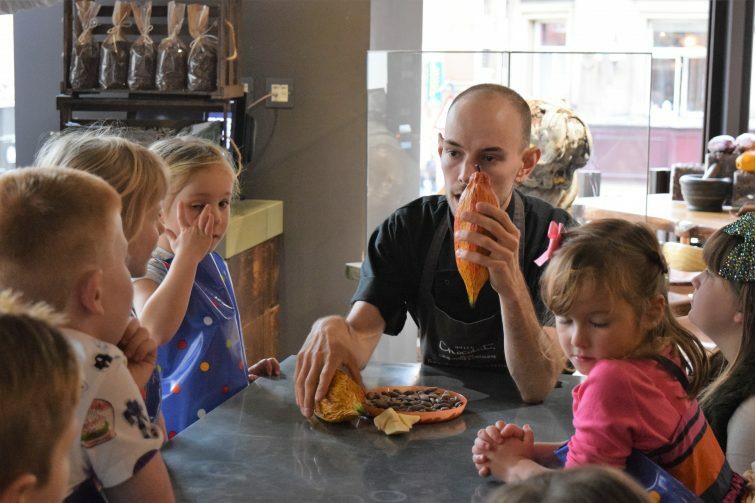 Dan explained to the children how the machines worked and just how long it took to roast the beans and then conch them (this is basically the process of grinding the roasted cocoa beans to make them smooth). I felt a little self-conscious that my group of eight excitable children were going to be disturbing other guests who were sat nearby enjoying a bit of cake and a hot chocolate but actually they were loving watching too! I think the children’s excitement was infectious! 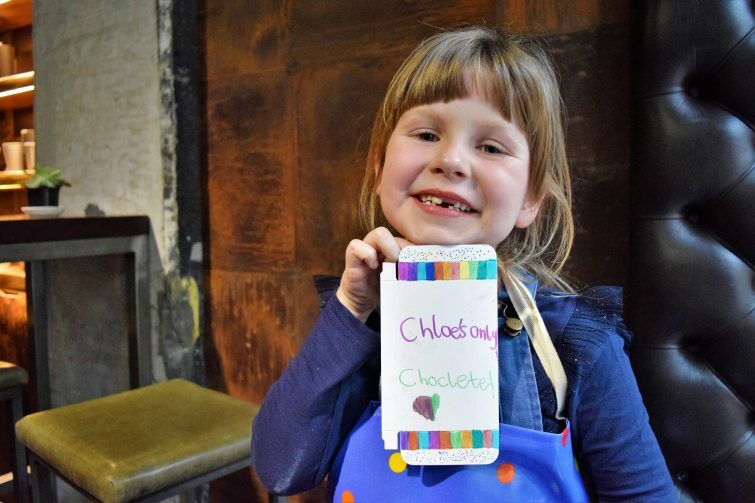 Chocolate making lessons done, we headed back upstairs so the children could decorate their own mini slab and create a self portrait on a smiley face lolly. 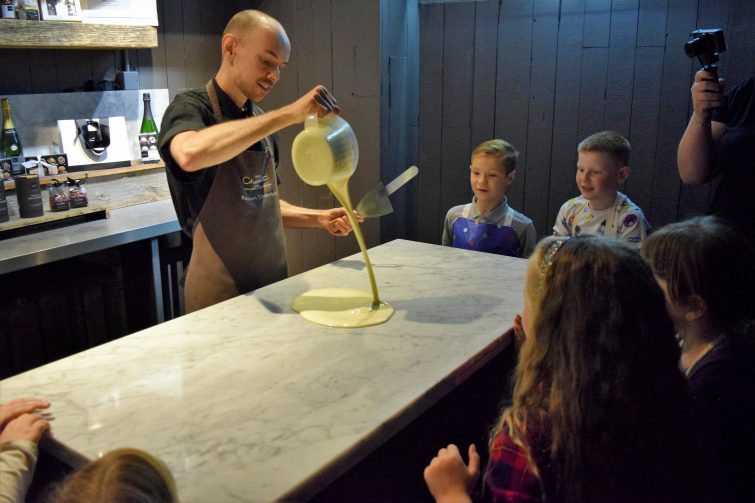 Dan gave a quick demonstration of the sorts of things the children could do and then let them loose with a whole array of ingredients including salted caramel shavings and dried raspberries. 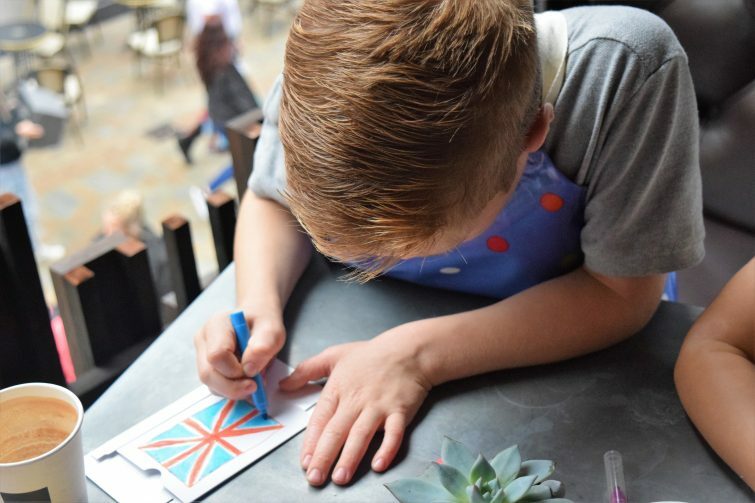 I was genuinely impressed by how careful and focused they all were, even the youngest children in our party worked hard to make some really lovely creations! They took their time and were very proud of their masterpieces (knowing that they were going to be able to take it home and eat it was a bonus!) Safe to say there might have been a little taste testing of the ingredients and one or two finger licks at this stage . . .
Chocolate masterpieces complete and each of our party guests took a moment to enjoy a hot chocolate. 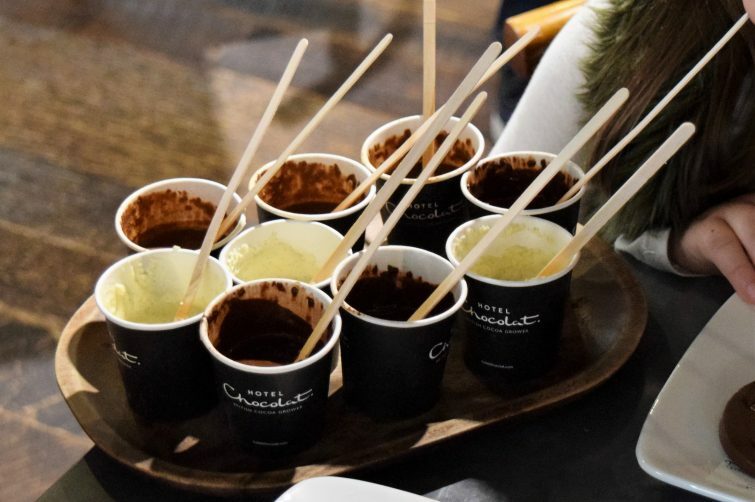 Now, if you haven’t had a hot chocolate from Hotel Chocolat before then I promise you, you are missing out – they are incredible and you need to get to your nearest cafe pronto! 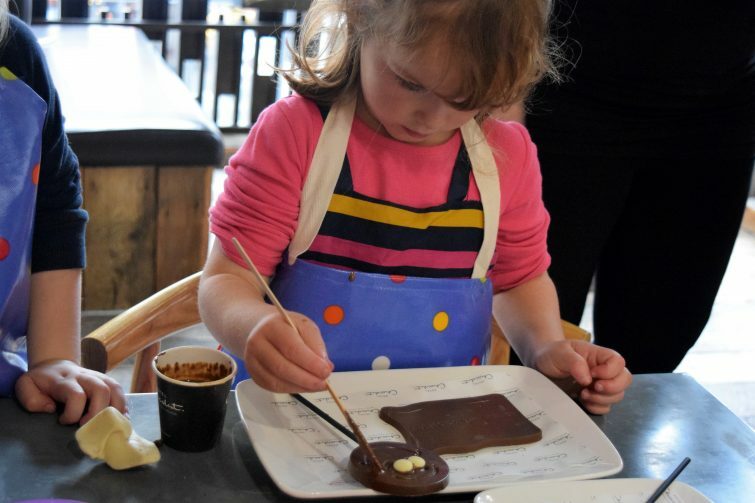 The final part of our Children’s Chocolate Workshop focused on personalising and decorating our very own chocolate boxes to ensure that our mini slabs could be transported home in tip top condition (though I think we all knew that getting it home without a sneaky nibble would take some willpower!) This was a lovely opportunity for the children to sit together and chat whilst doing some drawing and colouring. Ben isn’t a big fan of anything that involves putting pen to paper for the most part but this had a real purpose so he was more than happy to spend the time on it. When it was time to say goodbye, the children were each presented with a certificate and a goody bag (containing their own slab and lolly along with a Tiddly Pot – I was basically the meanest person ever as I insisted they couldn’t eat any of it till they got home!! 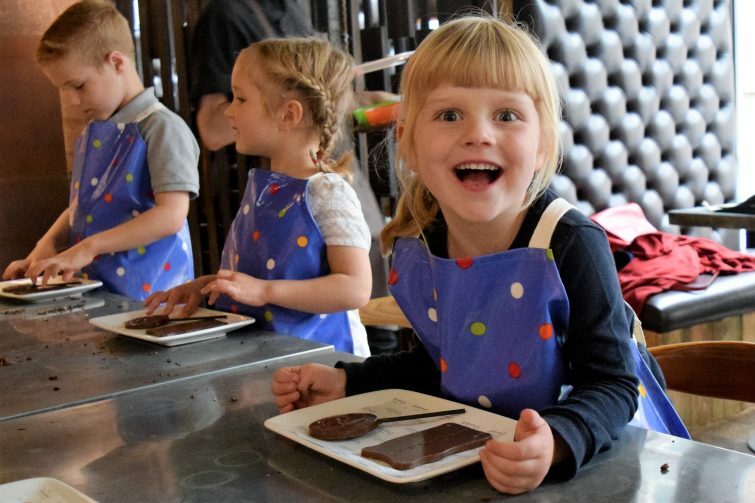 If you’d like to book your own Children’s Chocolate workshop then these are currently available in Leeds and Covent Garden – you can check the availability of your chosen date and times online . 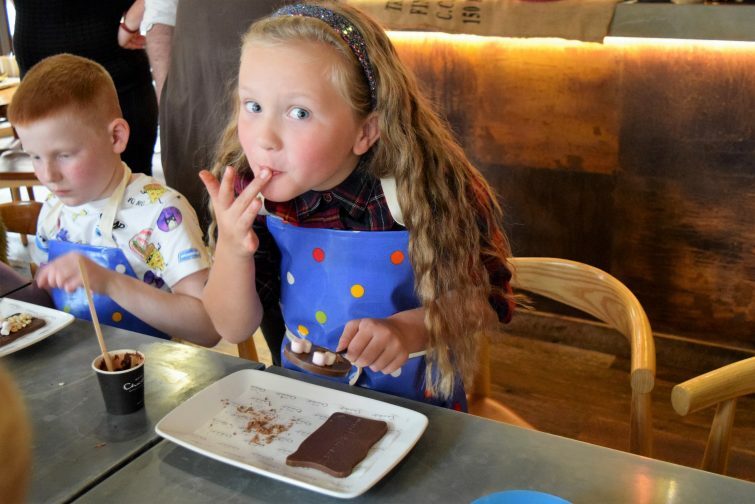 And, if you’re thinking you might fancy a go at this yourself, never-mind the kids, then you’re in luck as the guys at the Leeds Chocolate Metropolis can tailor events to suit your needs from Children’s Chocolate Workshops to Tasting Adventures (totally fancying one of these!) – they can host a birthday party, a baby shower, a hen do or a corporate event in their private upstairs event space. The best thing to do in this case is to pop in store or give them the a ring so they can chat this through with you. Never mind kids, I wanna go! They do grown up ones too! 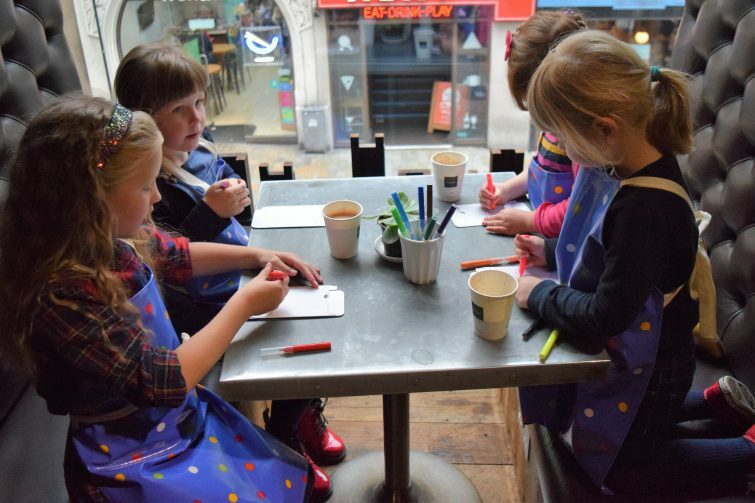 I love the look of this, I know my daughter would love this as a birthday party – they need to be nearer to us! I would think it might be something the introduce to more locations as time goes by. Oh my goodness my kids would LOVE this! 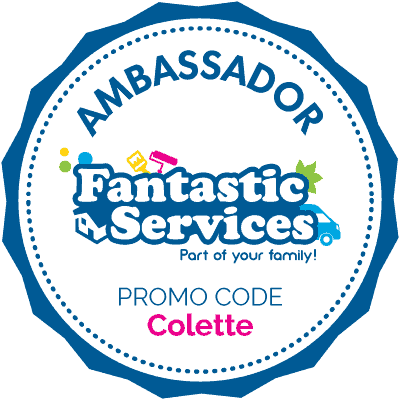 What a great experience for children….It sounds like a lot of fun and educational too! Yes they learnt to much from it! It’s such an interesting process. Maybe you should book an adult one instead! I know, it really made me giggle to see them sneaking cheeky little tastes! It was lovely to do something so different with them. They do Tasting Adventures for adults too! 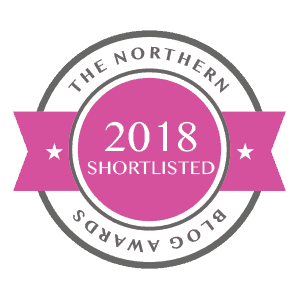 Thanks for the feature in Tried and Tested! 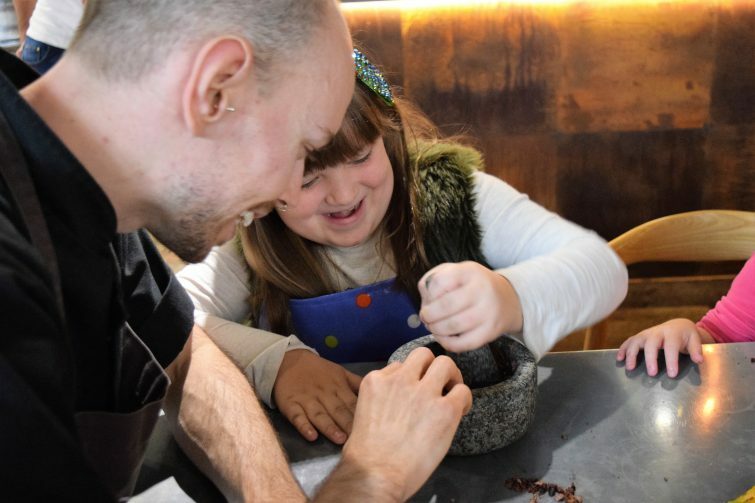 🙂 WOW, never mind the kids, I’d love the opportunity to have a Hotel Chocolate workshop! They do Tasting Adventures for adults – you should look into it! It was great to do something so different with them. 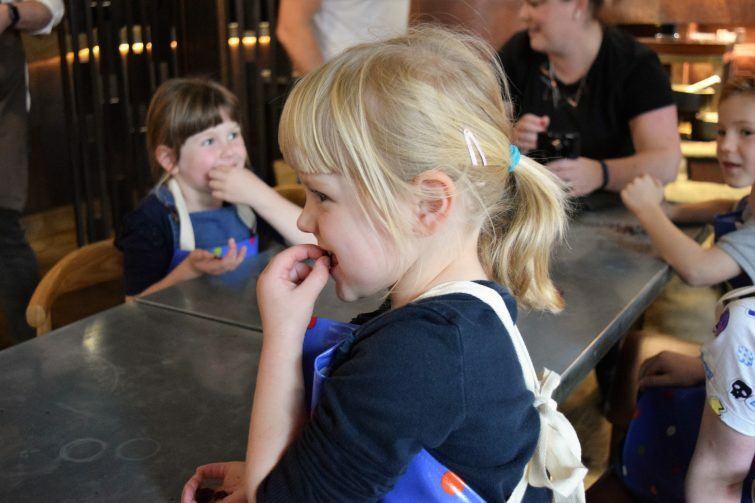 Now that looks like it was a lot of fun (and a little educational too), but mostly fun and chocolaty! This looks absolutely unreal, what a treat for them!! Even I would be jumping for joy at this, never mind the smalls.